The Third Edition of CMOS Circuit Design, Layout, and Simulation continues to cover the practical design of both analog and digital integrated circuits, offering a vital, contemporary view of a wide range of analog/digital circuit blocks including: phase-locked-loops, delta-sigma sensing circuits, voltage/current references, op-amps, the design of data converters, and much more. 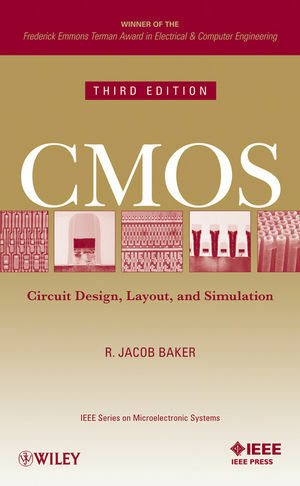 Regardless of one's integrated circuit (IC) design skill level, this book allows readers to experience both the theory behind, and the hands-on implementation of, complementary metal oxide semiconductor (CMOS) IC design via detailed derivations, discussions, and hundreds of design, layout, and simulation examples. R. JACOB (JAKE) BAKER, PhD, is an engineer, educator, and inventor. He has more than twenty years of engineering experience and holds more than 200 granted or pending patents in integrated circuit design. Jake is the author of several circuit design books for Wiley-IEEE Press. In 2007, he received the Hewlett-Packard Frederick Emmons Terman Award, which is presented annually to an outstanding young electrical engineering educator by the Electrical and Computer Engineering Division of the American Society for Engineering Education. Chapter 1 Introduction to CMOS Design. Chapter 3 The Metal Layers. Chapter 4 The Active and Poly Layers. Chapter 5 Resistors, Capacitors, MOSFETs. Chapter 7 CMOS Fabrication by Jeff Jessing. Chapter 8 Electrical Noise: An Overview. Chapter 9 Models for Analog Design. Chapter 10 Models for Digital Design. Chapter 12 Static Logic Gates. Chapter 14 Dynamic Logic Gates. Chapter 15 VLSI Layout Examples. Chapter 17 Sensing Using ?S Modulation. Chapter 18 Special Purpose CMOS Circuits. Chapter 19 Digital Phase-Locked Loops. Chapter 24 Operational Amplifiers I. Chapter 25 Dynamic Analog Circuits. Chapter 26 Operational Amplifiers II. Chapter 27 Nonlinear Analog Circuits. Chapter 28 Data Converter Fundamentals by Harry Li. Chapter 29 Data Converter Architectures by Harry Li. Chapter 30 Implementing Data Converters. Chapter 31 Feedback Amplifiers with Harry Li. Additional chapters covering the implementation of data converters and the analysis/design of feedback amplifiers, all of the changes found in the Revised Second Edition, and other changes to ensure the most up-to-date and modern information. In addition, the book's companion website, CMOSedu.com, has been expanded with support for Cadence and with additional videos, solutions, simulation examples, and homework problems. The book’s accompanying Web site, CMOSedu.com, offers numerous examples for many computer-aided design (CAD) tools including Cadence, Electric, HSPICE, LASI, LTspice, Spectre, and WinSpice. Readers can recreate, modify, or simulate the design examples presented in the book. In addition, the solutions to the book’s end-of-chapter problems, the book’s figures, and additional homework problems without solutions are found at CMOSedu.com.